Jim Bentley welcomes Steven Old to Morecambe. 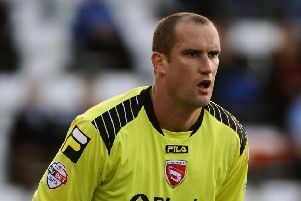 Morecambe have completed the signing of a New Zealand international defender. Steven Old arrives at the Globe Arena on a one-year deal having most recently been playing in Sweden. A varied career has seen the 31-year-old play in his homeland, the Chinese Super League and for Kilmarnock in the Scottish Premier League. Old, who has 17 international caps, has also had spells with Basingstoke Town and Sutton United with his move subject to international clearance. Shrimps’ boss Jim Bentley said: “Steven is a very experienced player who has had some really high points throughout his career. “He’s been a captain at previous clubs and has good leadership qualities, which we need within our squad. “I’ve done a lot of research on him and he comes very highly recommended and I’ve also watched hours of games and clips from his time abroad and have been very impressed with what I’ve seen. “He’s a strong, physical player and technically and tactically very good. Old will wear the number five shirt, previously worn by Ryan Edwards with the Shrimps’ player of the year having joined Plymouth.